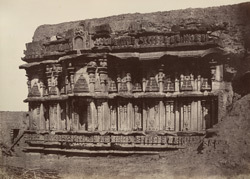 Photograph of the Amriteshwara Temple at Annigeri in the Dharwar district of Karnataka, taken by William Henry Pigou in 1855, from 'Architecture in Dharwar and Mysore.' The Chalukyas of Kalyana were a dynasty which ruled portions of the Deccan, now in Karnataka, Maharashtra and Andhra, from the 10th to the late 12th century, and left behind a rich legacy of temple architecture. The Amriteshwara temple, dedicated to Shiva, is a large black stone structure, mid-11th century, which has preserved its tower. In front of the shrine there is a closed mandapa or hall, a large side porch and an open porch. The sculptural decoration of this temple is very rich and consists of miniature architectural elements, foliage, and small figures of gods, attendants, mythological figures and animals.